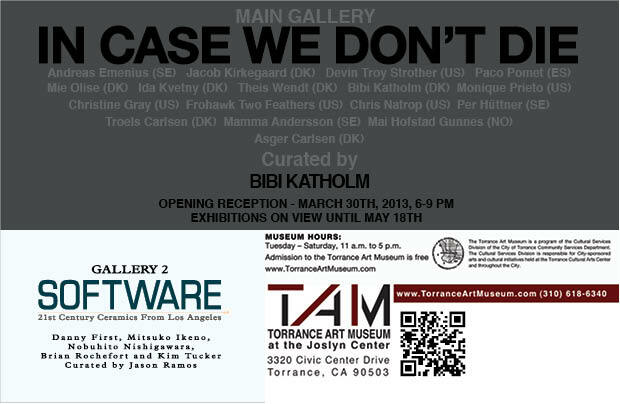 Opening reception March 30, 2013 from 6 – 9 p.m. These days potential catastrophes are everywhere you look. You can’t go outside or turn on the TV without reports of the world coming to an ‘End’ - global climate collapsing or terrorists planning new attacks. The world is so full of danger, threats, stress, overload and insecurity. Assuming that we, against all odds, survive the terrifying pitfalls of the future, is creativity going to be the thing that saves us? Will our imagination become an escape route, a place where we can hide, or will it be the one thing that forcefully confronts us with the truth and gives us the strength needed to make a change? What kind of art would a generation of unlikely survivors produce and where would they find their inspiration? What influence would surviving a catastrophe have on our values, ethics and our perception of truth and how might this situation visualize itself in the art of the future? This pressure coming from a hyper tense society of doom is having a massive impact on the art being produced by the artists who manage to keep up their practice and it is forcing others to remain passive or paralyzed while waiting for a change of current that may never come. One of the ways in which you can see contemporary art adjusting to the current circumstances is the merger between art and social politics, manifested in movements such as the Occupy movement. New media and the social networks have made it possible for spontaneous online societies to form, spread and organize themselves, and staging real life, long term protests that resemble cultural events or art performances, but also represent a new kind of radical democracy that aims to “occupy the future” and resurrect the hope that’s been lost. From 8-9 p.m., on the night of the opening reception, there will be a live performance by Dreamers, who describe themselves as, “An electrical storm of punk rock and minimal techno.” More info here.